Elements can be removed by right-clicking an element in the Document Layout tree and selecting Remove. Elements can be edited by changing their attributes. Each element has their own set of attributes which will be shown once an element is selected in the Document Layout Tree. 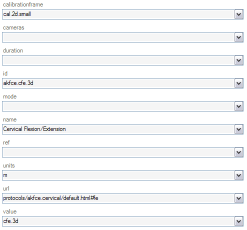 The below example shows the attributes relevant to an apas3d element. 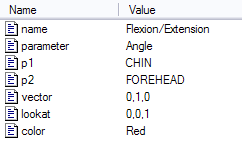 Find the the apas3d element called Cervical Flexion/Extension in the Document Layout Tree, located under Functional Capacity Evaluation, Kinematic Analysis, Neck Analysis. This subprotocol is of the type apas3d - a kinematic data collection protocol, uniquely identified as akfce.cfe.3d, named Cervical Flexion/Extension, with units of m (meters), using a calibration frame called cal.2d.small, and having a default value of cfe.3d. The operator is suggested to look at the Flexion/Extension angle, which is defined as parameter is Angle, named as Flexion/Extension, p1 is CHIN, p2 is FOREHEAD, the vector to calculate the 2D angle against is x=0, y=1, z=0, the lookat vector is x=0, y=0, z=1, and data should be displayed as a Red line. 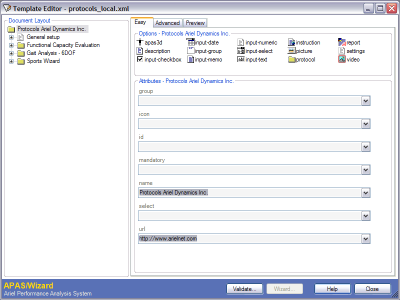 Alternatively the Advanced Tab can be used to edit the current elements. 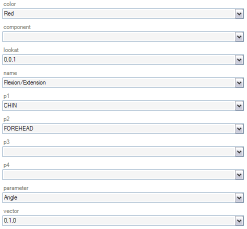 The section Elements shows the currently selected element in the Document Layout Tree and all its children. Double-clicking any of the elements allows you to edit its attributes. The section Attributes shows the attributes of the element currently selected in the Elements section above it. Double-clicking any of the attributes in this section allows you to edit the attribute. The currently selected element can be previewed on the Preview tab. This is what the protocol element would look like when encountering it in the Wizard screen. Generated on 4/25/2019 11:06:33 AM (PST) ADI/HQ/GBA/2019/ARIELCLOUD/v3.0.2018.0126.